Bella Finau-Faumuina, left, and Delia Parker-Ulima have opened a scrapbooking store in Kalihi -- Island Paperie -- specializing in tropical designs. "The creative natives are back in Kalihi." That is the motto taken up by Delia Parker-Ulima and Bella Finau-Faumuina, owners of Island Paperie, an all-Hawaiian scrapbook supply store in Kalihi. Create an "Island Love Brag Book"
The two grew up in the area, so it's been a welcome return to their stomping grounds. 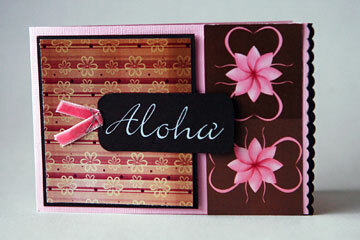 They're also quite familiar Hawaiian scrapbooking design, and the intricacies of helping others preserve personal and family history. Five years ago, they began the wholesale business Creative Native Arts in their living rooms, offering scrapbooking accessories with tropical themes. Excess material was tucked away at relative's homes or in storage facilities. Now they've gone retail, with their Creative Native Arts' stock moved to the back storeroom of Island Paperie. "We wanted a central location. We are located near downtown and the airport. And, we are near home again," said Parker-Ulima. Alicia Hapai-Takitani, owner of the original Island Paperie on Maui, approached the two women when she decided to open an Oahu franchise. Hapai-Takitani started her business, Kilinoe's Paperie, in 2000, specializing in invitations using papers from around the world. The store evolved into Island Paperie when she expanded to include paper with cultural designs for scrapbooking, card-making and invitations. She'd been buying items from Creative Native Arts for several years when she decided to branch out. "I wanted to open a store on Oahu," she said. "I felt comfortable passing on the responsibility to them." Island Paperie patrons use the store's materials to make colorful, island-themed pages, such as the one above by Candice Hironaka. The new Island Paperie offers a wide variety of tropical themes, from leis and palm trees to cockroaches. "We have the largest selection of Hawaiian print paper in the world," said Parker-Ulima. "We always have new designs and you can find stuff here that you can't find anywhere else." And its not just paper. Brass stencils, die cuts, laser cut images, transparent overlays and albums are among the finds. The store also offers an array of custom-made invitations. Tourists gravitate toward beach scenes and bright colors, said Parker-Ulima, while locals favor palaka prints and hula. 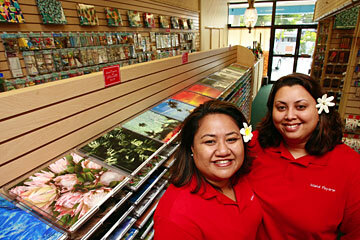 "We have lots of tourists visiting the store, but we also want to cater to the Oahu market more. We see a need to expand and include Asian-themed items." Scrapbooking, she said, is the nation's No. 1 craft hobby. "We've seen the industry move from a $200 million to $2.5 billion industry in five short years. Our local scrapbook community has grown by leaps and bounds, and our military wives are scrapbook addicts, as well as the many visitors who come to Hawaii each year." Besides materials, the store will soon offer space to work -- a crop center offering use of supplies such as stamps, punches and scissors. Opening in February, it will also have an idea center with books and magazines on topics from holiday ideas to bridal and home decoration, and a photo tech center. The crop center will be available for rent for group classes and scrapbooking parties. Finau-Faumuina also said they're expanding their selection of classes. "We would like to offer classes for the elderly. They have so many stories to tell," she said. Mommy and keiki classes are another consideration. And for non-scrapbooking dads? The shop's Ho'okipa Lounge -- with a flat-screen television and comfy chairs -- is a rest area for husbands and children to use while their scrapbookers are shopping. "We want people to be wowed by the atmosphere," said Finau-Faumuina. 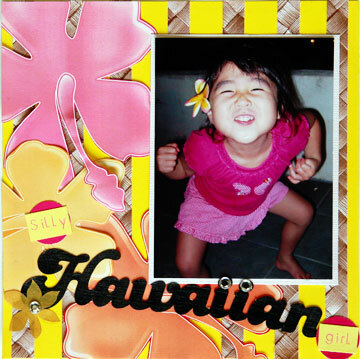 "We want the store to feel like the islands, where people are greeted with aloha." Island Paperie is is at 555 N. King St., next to Green Papaya. Hours are 10 a.m. to 6 p.m. weekdays and 9 a.m. to 3 p.m. Saturdays. Call 842-9100. For information on the Maui location, visit www.islandpaperie.com.